A woman who experienced a devastating ankle injury after a flatbed truck crashed into her minivan has agreed to settle her case for $939,000. It’s the highest settlement or verdict ever reached for an ankle injury in her county. In this issue, we’ll talk about what happened in this particular case and talk about what it means to settle. The woman and her husband were struck by a flatbed truck after it crossed over into oncoming traffic. The chain reaction was caused by a fully loaded 80,000-pound coal truck that rear-ended the flatbed truck, throwing it into the woman’s lane. The couple sued the owners of the coal truck, saying that the driver did not maintain a proper speed. The driver of the coal truck could not explain why he wasn’t able to stop. He could only offer the observation that by the time he did try to stop the truck, it was too late. Did Lure of Work Lead to Coal Truck Driver’s Poor Decision? 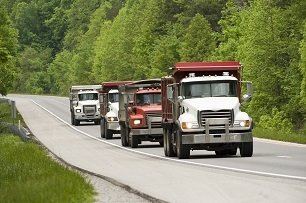 Speaking with reporters, the woman’s attorney hinted that the coal trucker’s company encouraged the driver to make as many runs a day as possible, which could have led to a lessening of standards. Because of the injuries to her ankle, the woman had to be transferred to several hospitals before finally undergoing a complicated orthopedic surgery to repair it. While the doctor was able to save her foot, she was unable to return to work. Let’s begin with the basics just to make sure we’re all on the same page. The word “settlement” is a term used to describe a formal ending to a legal dispute without the involvement of a jury’s verdict or judge’s ruling. In most cases, the settlement comes in the form of a certain amount of money offered by the defendant in exchange for the plaintiff’s agreement to release the defendant from any liability. Perhaps the most difficult aspect of the option to settle is the negotiation process. The reasons vary, but often times what the defendant feels is appropriate compensation is vastly different to what the plaintiff (you) thinks is appropriate. If you’ve suffered injuries because of someone else’s negligence, it’s very important that you speak with an attorney skilled in personal injury law so that you’re properly compensated for lost wages, medical bills, etc.